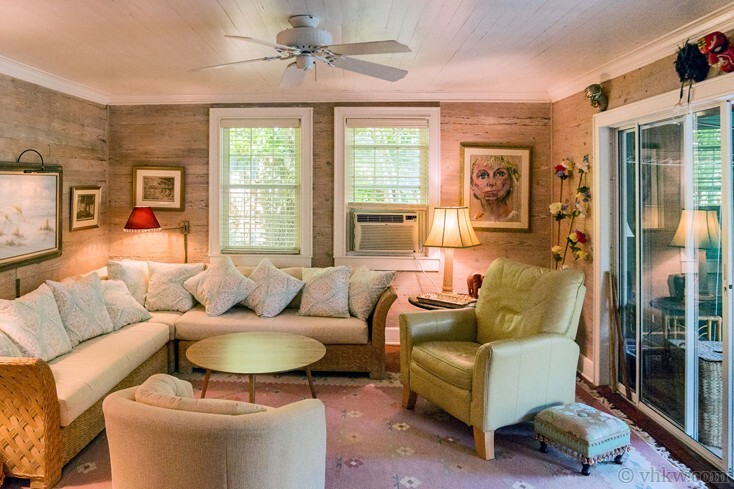 ‘Heads Up’ to all of you incurable romantics who are looking for the perfect Key West garden cottage retreat. This Little Red Pool-Garden Cottage is so story-book worthy that I live in the same neighborhood and even I want to stay in this cottage for a month … or longer. This is the ideal get-away for a couple, or if you are alone that’s okay too. It’s a lovely quiet place to write, contemplate, relax and heal, swim, get massages by the pool, read, and dream. Dream worthy and authentic, it’s a little bit like ‘Little Red Riding Hood’s cottage merges with a ‘Fantasy Island’s’ private pool garden,’ and the two are seamlessly blended. 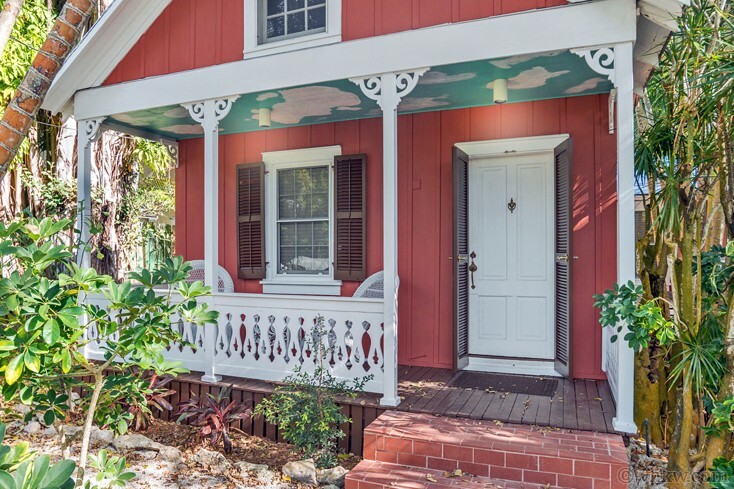 The first time I homed-in on the enchanting details of this idyllic Key West cottage, I was walking by at sunset and noticed how the pink glow was softly lighting up the front garden. An artist had set up his easel in front of the fence, and was completely focused in his effort to paint its fairy-tale qualities. Set back a bit from the fence, it’s easy to miss this cottage when you pass by, but its endearing quality caught the artist’s eye. Uniquely painted a rich palate of Van Gogh red with crisp white trim and gingerbread fence, the front porch ceiling has adorable puffy clouds painted on it, and you know something unique is set up inside. 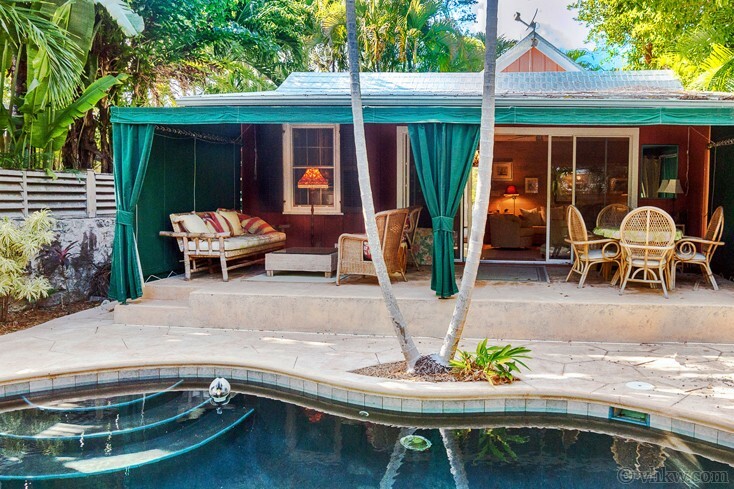 Perfectly nestled in the trees, the tin roof has just enough dusting of patina to portray the perfect facsimile of KeyWest story-book garden living. 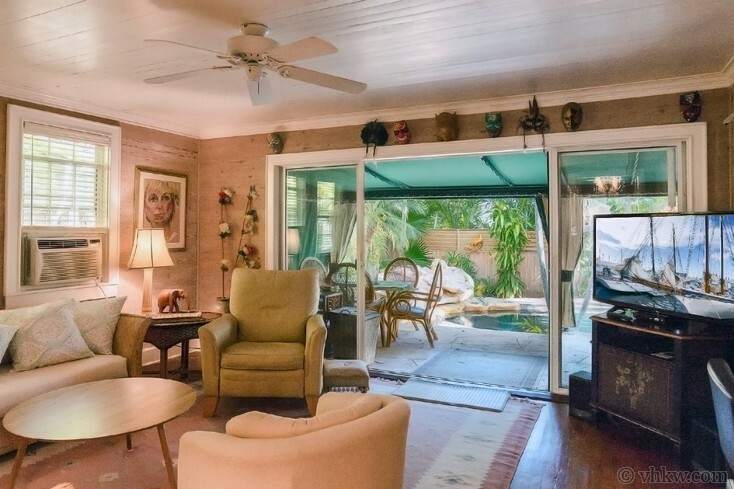 It sits on a ‘road less traveled,’ in the distinctive Casa Marina neighborhood closed to Higgs Beach, in an island oasis where a rare spring-fed well provides plenty of water. 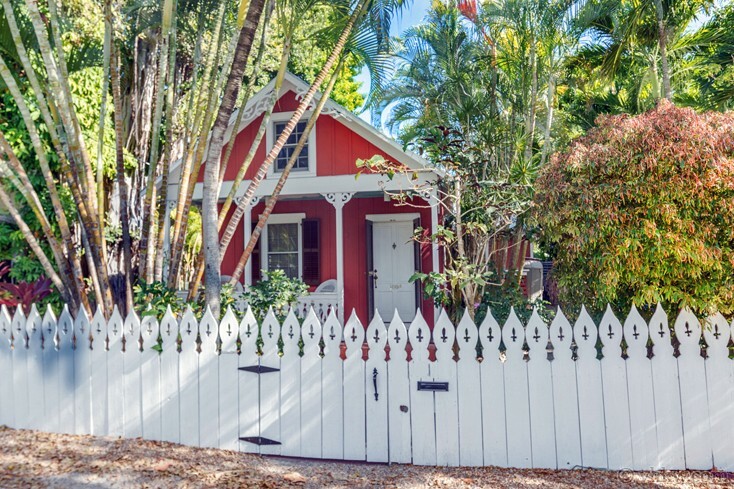 Truth be known, the Little Red Pool-Garden Cottage was originally built in the late 1800’s on Margaret Street in downtown Key West. Sometime in the 1930’s it was treasured so much, it was moved to its current tropical garden spot. I love that this happened … that someone so valued the simple beauty of this cottage, that they had it moved across the island to become part of a garden oasis. 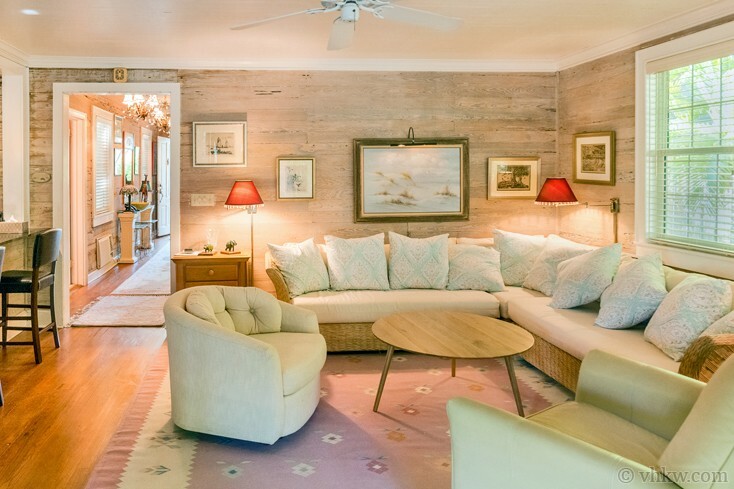 The owners of this endearing Key West cottage gave it a thoughtful renovation that carefully maintained its original integrity, while providing all the necessary living comfort upgrades. The front interior was left in its authentic layout, and when you enter the front door, you step into the long hall that leads to the back of the cottage and tropical great-room. Immediately on your left after you enter, is the guest bedroom. This pretty room is furnished with a trundle bed, which can be made to one or two twin beds, and provides a nice window view to the front garden. 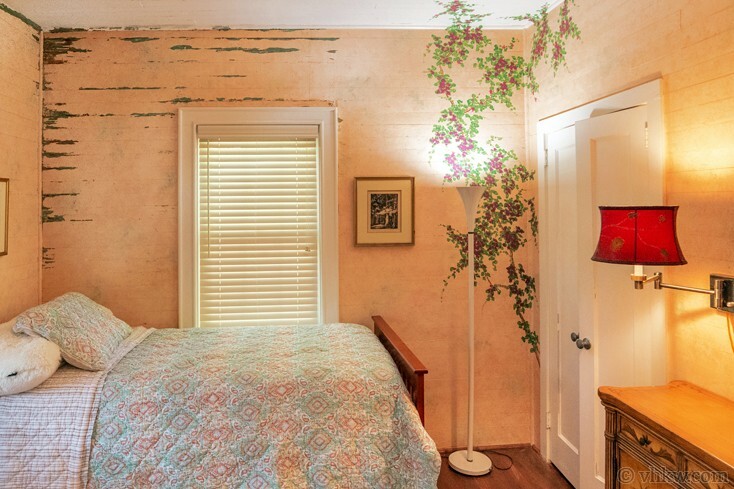 Original heart-pine walls are lightly pickled to show off the wood grain, and one wall, an artist painted a purple wisteria vine to bring the garden scene indoors. Sash windows are trimmed in white, and window screens are placed in all the windows, so when weather permits, they can be opened to invite in the breeze. 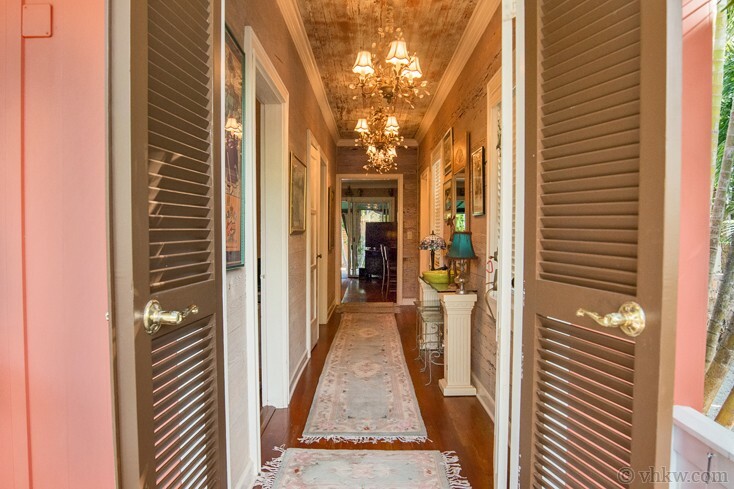 As we continue down the hall, towards the back of the cottage, the next door on the left is the master bedroom. 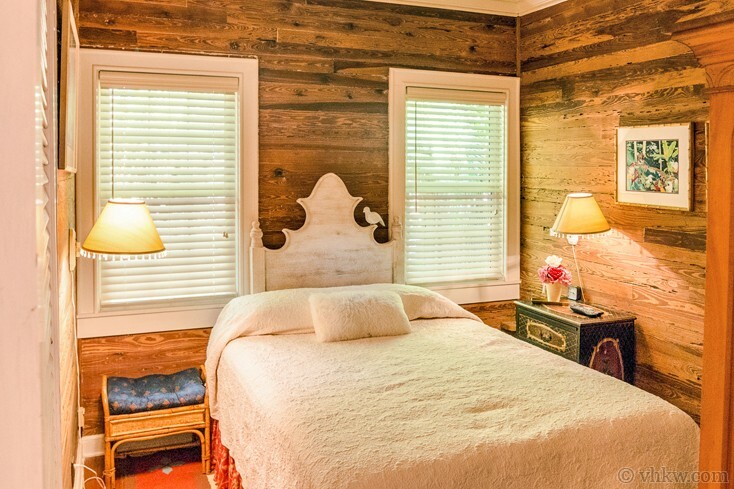 Again, original heart-pine wooden wall planks have been exposed to show authenticity, but this time they are left bare offering a romantic glow to the room. Everything about the cozy bedroom is inviting from the comfy queen size bed, to the cottage style furnishings, swing arm wall lamps, and beautiful art work. As with the front bedroom, sash windows have screens so they can be opened to welcome in fresh air. Across the hall from the master bedroom, and at the end of the hall, is the bathroom. Here again, wood ceiling beams were exposed to make the room feel larger and to show architectural detail, but in this room a transom window has been added to bring in the garden light. Mango colored tiles were laid on the shower walls, and white square tiles on the floors. Walls were then faux painted a peach-mango color, and as a finishing touch an artist hand painted flower vines on the beams. 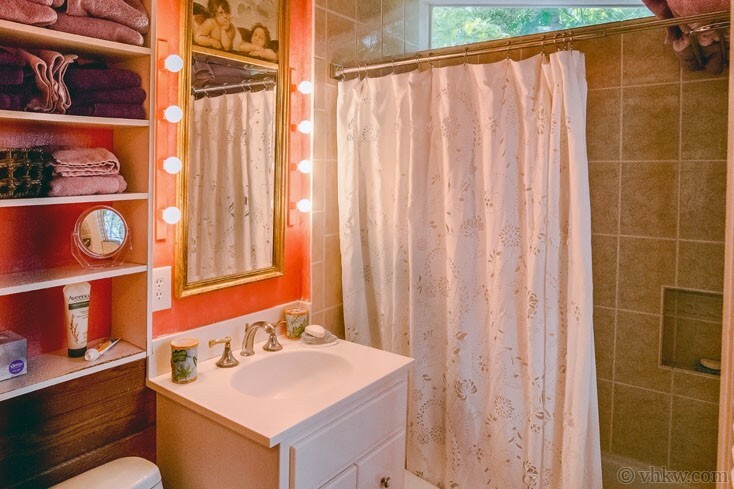 The bathroom provides a single vanity sink and a bath tub with in-tub shower. Continuing down the hall, we find the light airy great-room that spans the entire width of the back of the building. A light cream pickling wash helps to bounce light in the space while floors are varnished clear to feature the red-gold color of the wood. Done up in casual elegant island style furnishings, a large low-slung white wicker and canvas L-shape sofa is perfectly tucked into the corner of the lounging side of the room and a raspberry colored kilim rug stitched with a garden pattern point your eyes to the amazing pool-garden area. The entire space is further enlivened with eclectic folk art from the owner’s travels. 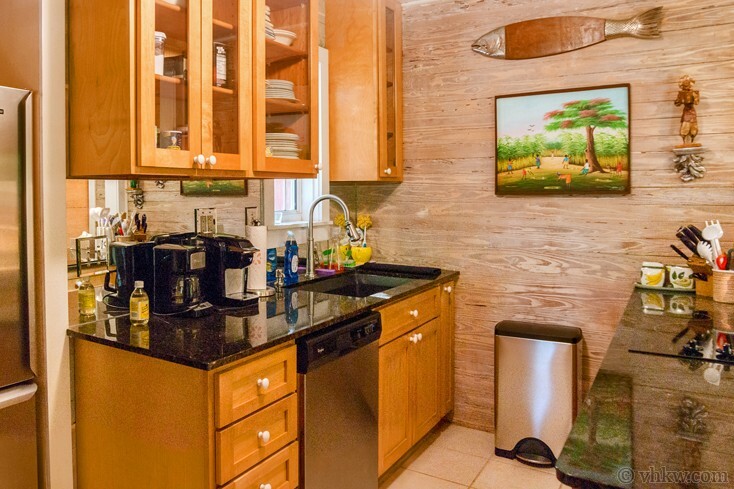 Before we feast our eyes on the pool-garden oasis in the back yard, we need to take a look at the kitchen. Situated on one end of the great-room, the renovated U-shape kitchen was brought to contemporary standards while retaining the cottage feel. Wood grain cabinetry topped with black granite counter tops, white textured floor tile, and a counter height dining bar off-set the kitchen from the lounging area. The owner’s mother, a forever avid outdoors woman, re-designed the back garden herself some years ago, to create her ultimate outdoor tropical fantasy living room. Her concept was to create an oversized outdoor garden room that stood as the main living space for the cottage. 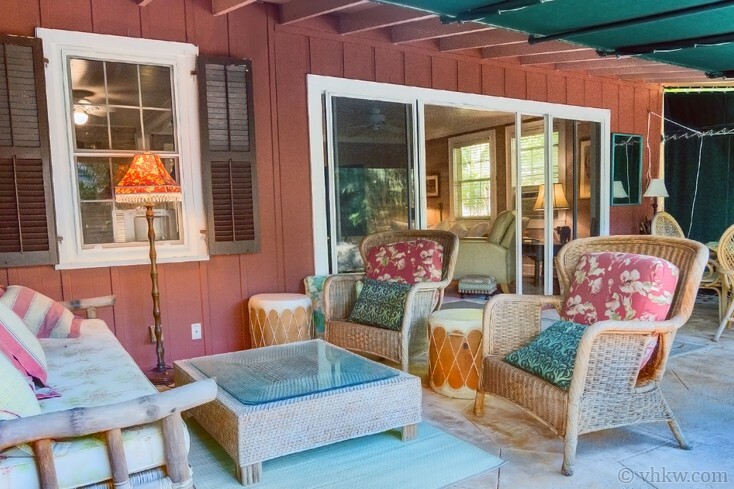 A deep canvas awning roof with ‘roll-up’ walls and flag-stone pattern patio floor defines the spacious room. A glass dining table with wicker chairs has been set by the pool for al-fresco dining. A few occasional chairs, tables, and lamps have been placed around to create the perfect place to lounge and relax after a dip in the pool. 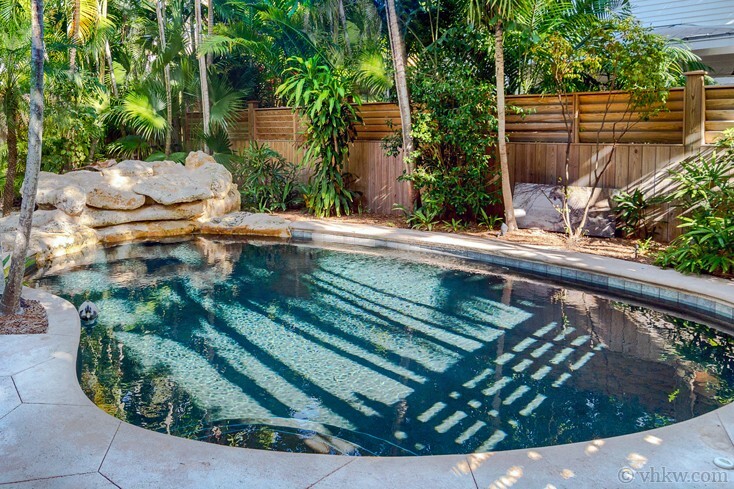 The elegant custom oasis-style pool complete with lounging benches, features a natural looking waterfall at one end, and when the water is running it makes me feel like I’m in a natural grotto far from town. A variety of palm trees, tropical hardwoods, and exotic under-story looks as natural as if they had arrived as volunteers to the garden. Sounds of rustling palm fronds, the soothing natural-style waterfall and oasis style swimming pool make it easy to restore your senses and relax into simple island-time and imagine you are far-far away. Amenities: Natural tropical garden maintained by professional gardener, private pool with water-fall. Large out-door living room / dining room area. Street parking in front. Split A/C system, cable TV, stereo, telephone, WiFi, washer dryer, linens and towels are provided, maid service on request. 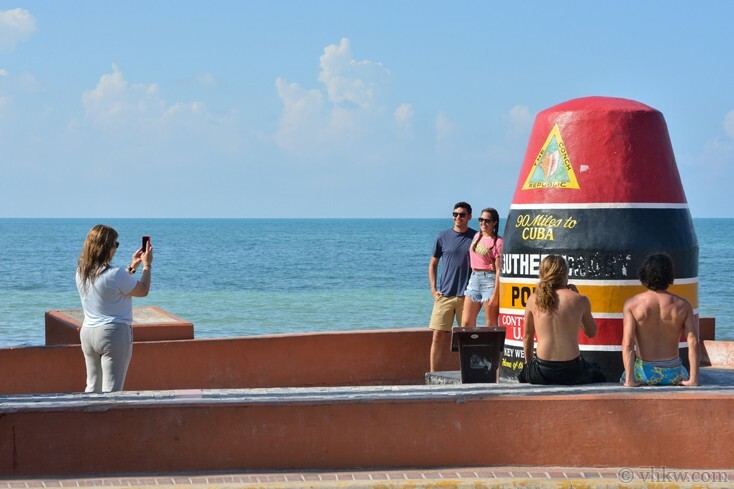 Activities: Within 5 minute stroll to Higgs Beach, White Street Pier, West Martello Fort, tennis courts near the beach, Key West famous Salute Restaurant on Higgs Beach, Casa Marina Resort property, Faustos Fine Grocery Store, Sandy’s Café walk up restaurant and Cuban coffee, local art galleries, and weather station. 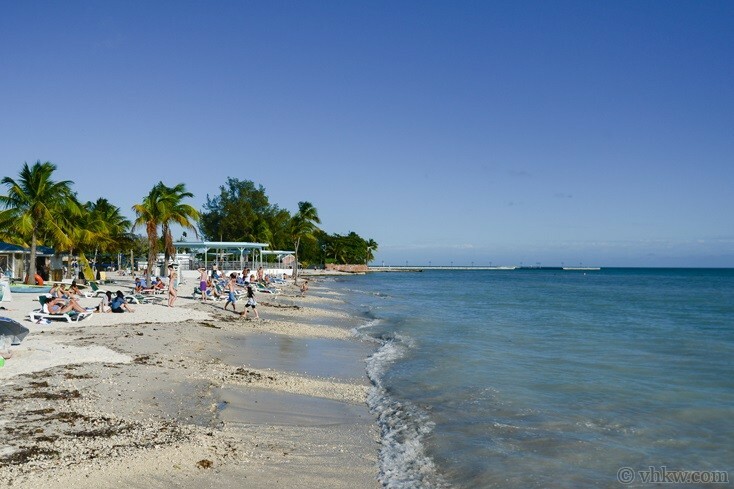 Walk or bike to most Key West Old Town attractions. 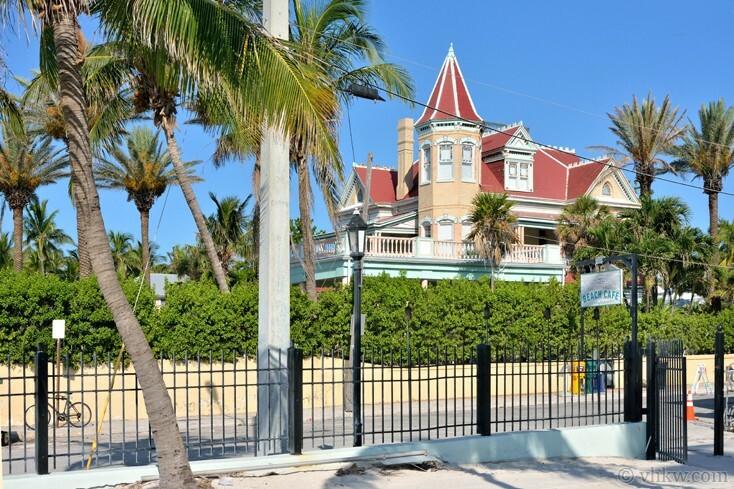 Area: This small exclusive Casa Marina residential district has grown into one of the most sought after neighborhoods in Old Town Key West. 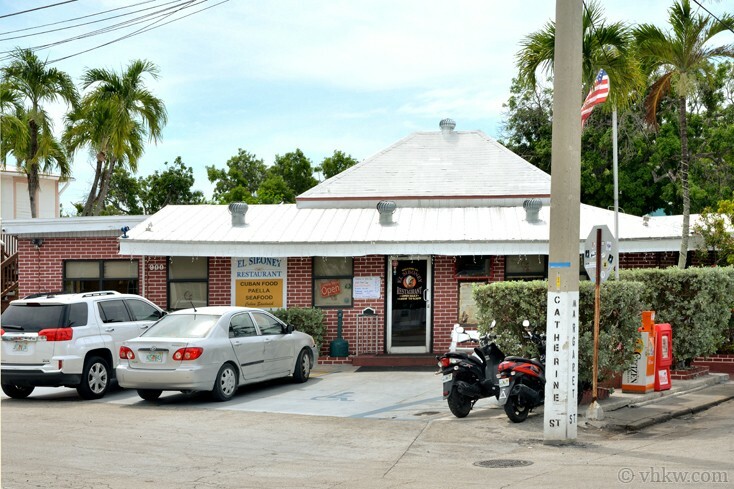 In the mid 1900's this area was considered the "country side" of the island, and the modern day result leaves a legacy of outstanding turn-of-the-century, mid-century and modern architecture with beautiful gardens and more yard space than is typically found in the other residential districts in Old Town Key West. Quiet residential area, close to the Atlantic Ocean and the White Street gallery and shopping area. I can’t say enough about the Little Red Cottage and the dealings we had with VHKW! The process of renting the house was flawless from the beginning. All questions were answered promptly. The house was exactly as presented on the website. It was clean and well stocked with everything one could need. The yard and pool were well kept up during our stay. It’s located in a lovely area. We hope to return to this wonderful little cottage soon! (It was not noted on the website that bikes were there. I would suggest that information be added.) 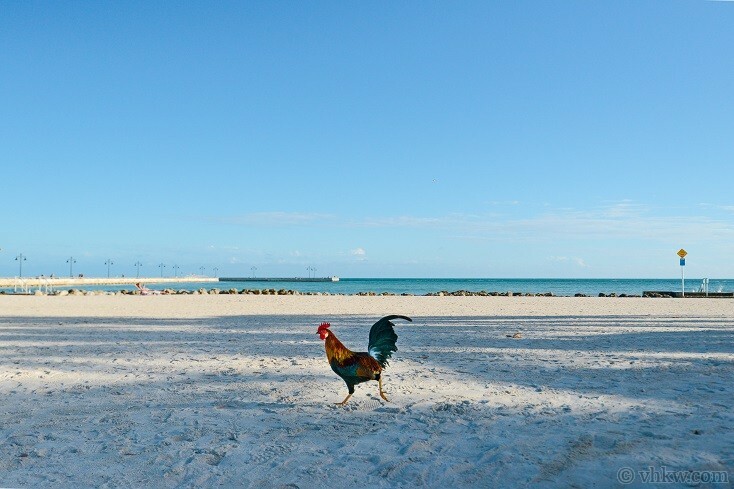 I’ve already recommended VHKW to family who are interested in visiting Key West.